Books related to The Baby-Sitters Club Super Special #1 : Baby-Sitters on Board! i looovvveeed this book! if you want romanse and your FAV bsc members GET THIS BOOK!!!!!!!!!!!!!!!!!!!!!!!! Disney and a cruise wow! I loved this book!! I read it 3 times. 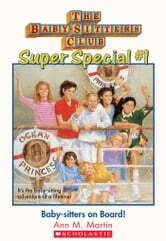 This book would most likely be my favorite baby sitters club book. recommended ages 8 plus , you would most likely love this book . I would also recommend the Baby Sitters Little Sister series . That features Kristy's seven year old step sister Karen. This was a spectaular novel it was exiting,fun and funny you deffeneley enjoying it you will laugh cry and wonder with a secret admeier old man and a lot of people#hilaurious just trust me read this BOOK!! !